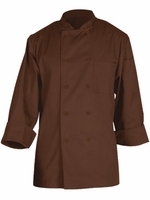 Chef Coats in a full range of colors. 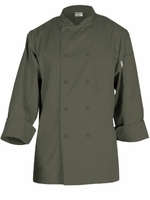 Our color chef coats by Chef Works offer a choice of colors to tie in to virtually any shade of kitchen or restaurant décor, from Raspberry Pink to Lime Green. 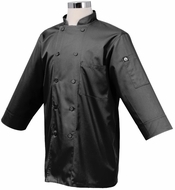 Our chef coats are all about comfort, convenience and durability; and now add a splash of color to the traditionally black and white kitchen arena. The colors range from basic earthy colors to vibrant reds, orange and blues. This color range is constructed out of either 6 oz twill or light-weight poly-cotton fabrics. Yarn dyed fabrics, to ensure color fastness, are used. Standard features on these colored chef coats include French cuffs, on the long sleeve range, left chest and thermometer pockets. The light weight range all feature self-color cloth covered buttons and ¾ sleeves. The color coat range can be paired with color coordinated aprons and beanies to create a stylish look which can be utilized in both the kitchen and the restaurant environment. For added impact these items can be personalized with embroidered names, titles and even establishment logo’s. Please see our Embroidery Info page for details.